Pacific Northwesterners love snow. I say this because we don’t get it very often and it usually doesn’t last. Yesterday was our first snow of the season, and it was a very light dusting. 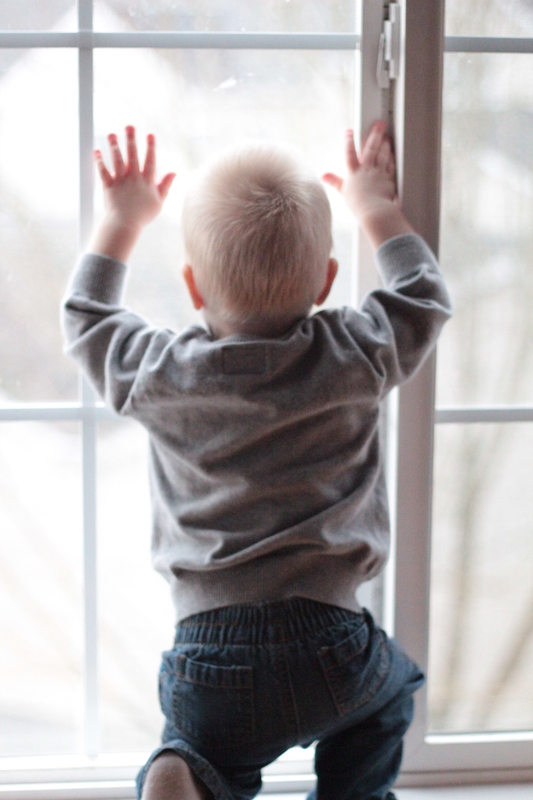 My one-and-a-half-year-old son was intrigued by the large white stuff floating down from the sky and kept pointing out the window. He was also licking the window pane, but that’s another story. With the weather so cold and the wind so biting, I decided to make a summer-y cake, to make myself feel warm and fuzzy inside. Plus, I just bought another 6-inch cake pan, and really wanted to make a cake for two. This cake makes way more than two, but it’s so cute and little, and well, I’m a sucker for those things. And I couldn’t have just one piece either, so it makes me feel better knowing it’s a small cake. 1. Having a flat surface when filling and frosting a cake is really helpful and really easy. You can use a long serrated knife to cut the top off of each cake, or you can use a cake leveler. I am not good with knives, so I use a cake leveler–I have this and this, both from Wilton. The more expensive one is for larger cakes, but both do the job just fine. 2. To make sure the filling doesn’t ooze out of the cake, create a dam. Place some lemon buttercream in a piping bag with a #10 or #12 tip, and go around the top of the bottom layer of the cake. Place the filling in the middle, using an off-set spatula to completely fill it in. 3. Have a crumb coat. All this means is that you create a messy, first coat, making sure the cake is evenly covered with frosting. Place in the fridge until the frosting hardens a bit, then coat a second layer. This traps in all the crumbs and creates a beautiful looking cake. 4. Place wax paper pieces under the bottom of the cake (between the cake and the stand) when frosting. If you’re like me, you’ll make a mess, and when you pull the pieces away from the cake, there won’t be any buttercream on the cake stand. Make sure they are pieces tucked under the cake. If you place a sheet of wax paper in-between the cake and stand, you won’t be able to get it off unless you lift the cake. 5. 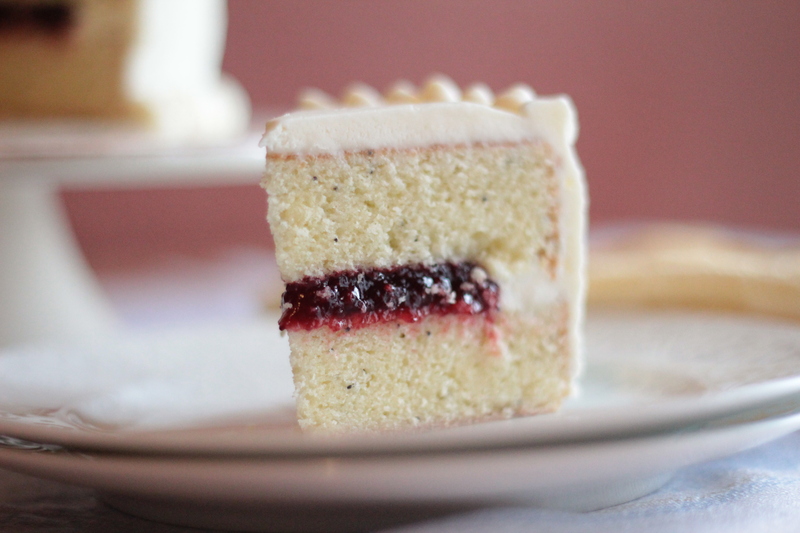 If you want to be a bit fancy, pipe small dots around the top and bottom of the cake, using a #10 or #12 tip. Preheat oven to 350 degrees. Lightly grease and flour two 6-inch round cake pans. In a large bowl fitted with a paddle attachment, cream butter on medium speed until light and fluffy, about 2 minutes. Add the sugar and continue beating, 2-3 minutes. Beat in the eggs, one at a time, making sure the yolk is fully dissolved. Add the lemon extract. Slowly pour in the cake flour, baking powder, salt, and poppyseeds, and mix on low speed until fully incorporated. Pour equal amounts of batter into each pan. (The batter is a little thick.) Use a spatula to move batter to edges and make even. Bake for about 30 minutes, or until the edges are lightly golden and toothpick entered comes out clean. Cool on wire rack for 10 minutes, then invert and cool completely. Beat butter with a mixer on medium-high speed until pale and creamy, about 2 minutes. Reduce speed to medium. Add sugar, ½ cup at a time, beating for 2 minutes after each addition. Beat in the extracts. Beat until buttercream is smooth. 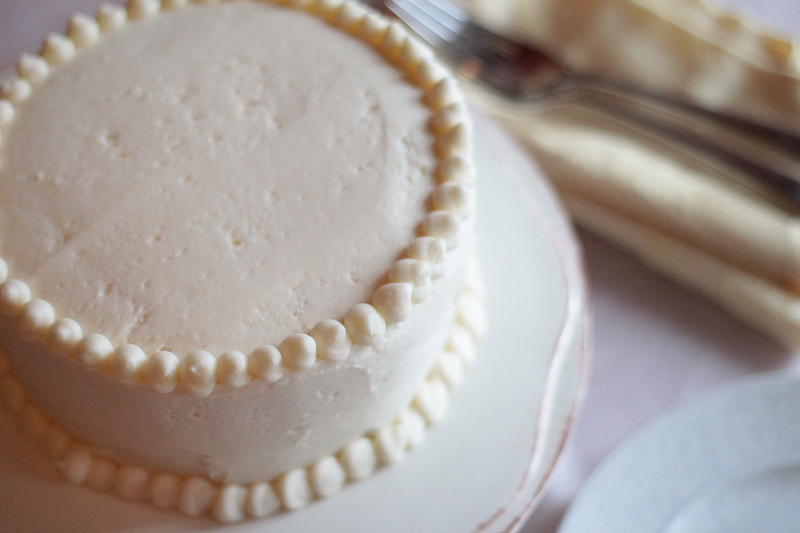 To assemble the cake: Cut the tops off of each cake with a cake leveler or a serrated knife. 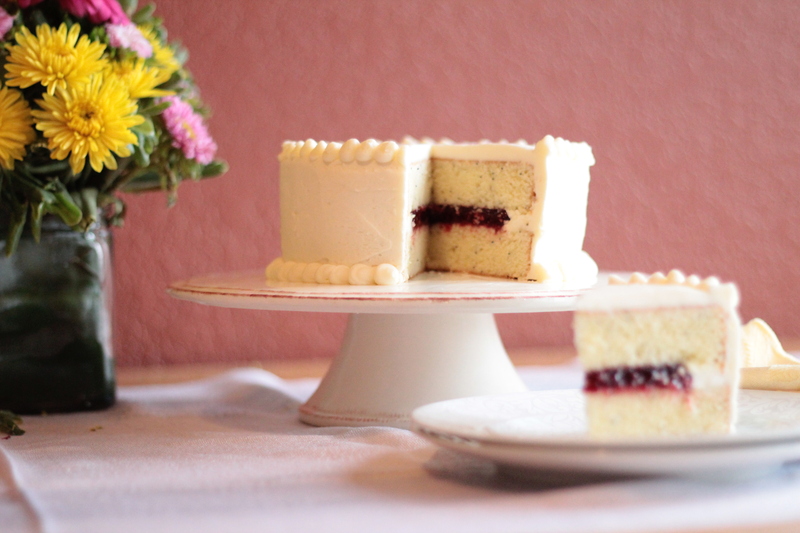 Place one cake layer on a cake stand. 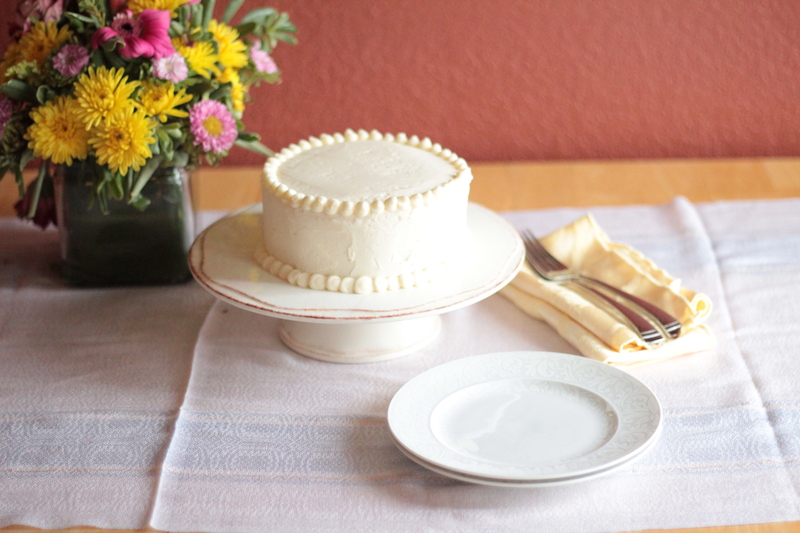 Tear off pieces of wax paper and place around the bottom of the cake, creating a layer between the cake and cake stand. Fill the piping bag with some buttercream frosting. Going around the edge of the cake, create a dam with the buttercream. Place some raspberry filling on the center of the cake. Using an off-set spatula, spread to the edges of the dam, adding more filling as needed to make sure frosting and filling are even. Place the second layer cake on top. To have a smooth, even top, flip the cake layer so the top is now touching the filling. Create a crumb coat and place in the fridge 10-15 minutes to set up. Frost the second layer, smoothing top and sides as needed. 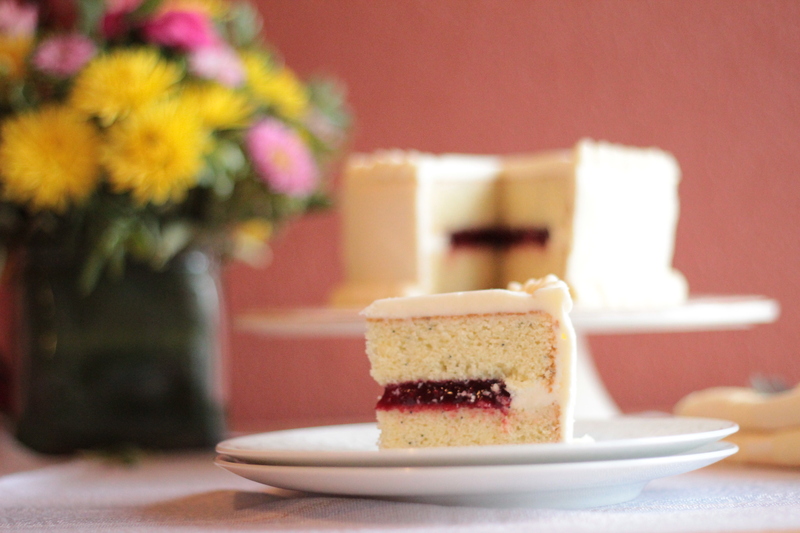 For a decorative touch, using a piping bag, create “dots” around the top and bottom of the cake with a #10 or #12 tip. Store any leftovers in an airtight container up to three days.